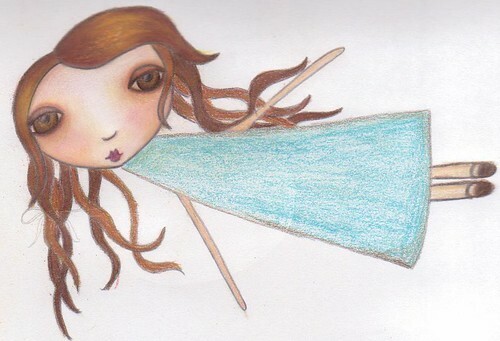 I drew this little flying girl last night using the new watercolor pencils (not crayons) and am thrilled with the way she turned out. It’s so much easier to get in and work on the details with the pencils. I’m wishing I had a few more colors though, like a brighter pink, a nice copper and maybe a brilliant purple. Ah the never ending world of art supplies! Her dress is left plain because next week I’m going to be learning how to collage paper dresses. She looked too sad with a vacant white body, so I had to at least scribble in a bit of color. Can’t wait to dig through my paper stash and pick out a new dress for her!